Wikipedia is the top search engine hit for millions of topics; Wikidata is the largest authority file ever created and Wikimedia Commons has more than 40 million digital images with potential use in research or education. Wikimedia projects overlap with all the work done across the university, whether in research, education, or curation. Spending a year as the university’s Wikimedian In Residence, I worked with various researchers and projects, tailoring the work to their goals. The Electronic Enlightenment/ Oxford Text Archive team were interested in biographical dictionaries of booksellers and printers, and getting these from page scans into a more usable format. We used a combination of Wikisource, Wikidata and Google Sheets to produce a digital text version of one of these books, a data set representing the book, and the book’s text as a data set, with crowdsourced help from the Wikisource volunteers. This team also wanted to explore getting more incoming links to the EE biographical dictionary. We arranged for Oxford University Press to give free access to EE for active Wikipedia editors who request it, and publicised this to the Wikimedian community. So far, 48 Wikipedia editors have been given free access to the service. We matched thousands of identifiers from EE with Wikidata, then used these data to identify people in EE with no Wikipedia article. With the Atlas of Hillforts, the interest was in getting incoming links to this newly-launched web site. We imported selected data fields into Wikidata, with links back to the Atlas for the full information. We matched Atlas records against Wikidata records where they existed, and tagged images in Wikimedia Commons with links to the relevant entry in the Atlas. We created a project page to tell the Wikipedia community what was happening, and used a tool to generate list articles in Wikipedia from the imported data. 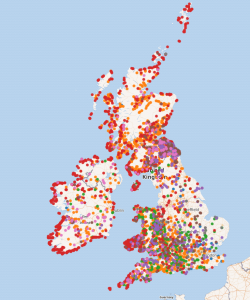 The Cultures of Knowledge group (who run Early Modern Letters Online) are interested in combining data about notable people and locations from historical sources, and having those data used in research and education. I have advised on how these data sources (including EMLO identifiers) are reconciled with Wikidata. Wikidata already has thousands of EMLO links and I was able to use these to find other sources about people in EMLO. The Oxford Research Archive had digitised thousands of doctoral theses and made them openly available. I created a new property in Wikidata to represent the institution to which a thesis had been submitted, and added data about the Oxford theses in a bulk upload. We then added thesis links to Wikipedia articles about notable thesis authors, such as John Vickers and H. A. Berlin. With the Voltaire Foundation, we worked on describing Voltaire’s most important works in Wikidata, including the non-fiction books that were subject of a project funded by the AHRC. These data were used in two custom interactive timelines, using the Histropedia software library. With Prof. David Zeitlyn, a cultural anthropologist whose work covers people and archives in Cameroon, we found that a limiting factor on coverage of this topic in Wikipedia was the lack of published secondary sources. I recommended a way to adapt existing open-access journal articles into Wikipedia articles. The Ritual Modes research group in Cognitive and Evolutionary Anthropology had tried to add articles to Wikipedia about their topic, but had been discouraged because an article had been deleted. I got the article undeleted and gave them advice on getting further articles accepted. The Women In German Studies group wanted training on how to improve Wikipedia articles in their field. In a training workshop, they learned about the behind-the-scenes efforts to improve coverage of women and to facilitate translation between different language versions of Wikipedia. For IT Services, I documented two kinds of event using Wikimedia platforms to engage the public in research, including instructions that would be given to participants. I also provided training workshops for two different groups of staff in IT services. There was a lot of interest in using Wikipedia, Wikidata, Wikisource and related open platforms. Queries continue to come in and I am working on using Wikidata to help the discoverability of objects in the university’s collections.